University College Cork (UCC) (Irish: Coláiste na hOllscoile Corcaigh) is a constituent university of the National University of Ireland. The university is located in Cork. The university was founded as a college in 1845 as Queen's College, Cork. 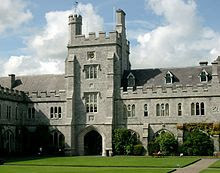 It became University College, Cork, under the Irish Universities Act of 1908. The Universities Act, 1997 renamed the university as National University of Ireland, Cork, and a Ministerial Order of 1998 renamed the university as University College Cork - National University of Ireland, Cork, though it continues to be almost universally known as University College Cork. Queen's College, Cork was founded by the provisions of an act which enabled Queen Victoria to endow new colleges for the "Advancement of Learning in Ireland". Under the powers of this act, the three colleges of Belfast, Cork and Galway were incorporated on 30 December 1845. The college opened in 1849 with 23 professors and 181 students and a year later became part of the Queen's University of Ireland. The original site chosen for the College was particularly appropriate in that it is believed to have had a connection with the patron saint of Cork, Saint Finbarr. His monastery and school of learning were close by at Gill Abbey Rock and the mill attached to the monastery is thought to have stood on the bank of the south channel of the River Lee, which runs through the College lower grounds. This association is also reflected in the College motto "Where Finbarr Taught, Let Munster Learn" which is also the current university motto. On this site (on a hill overlooking the valley of the Lee), the Tudor Gothic quadrangle and early campus buildings were built by Deane and Woodward. Over the coming years the College gained a standing for excellence in various fields, including mathematics, medicine and the humanities. The medical buildings were built in stages between 1860 and 1880, and the faculty quickly gained a reputation for the quality of its graduates. The first two women to graduate in medicine in Ireland did so in 1898 (this was notable as it was more than 20 years before women were permitted to sit for medicine at the University of Oxford). In the following century, the Irish Universities Act (1908) formed the National University of Ireland, consisting of the three constituent colleges of Dublin, Cork and Galway, and the college was given the status of a university college as University College, Cork. The Universities Act, 1997, made the university college a constituent university of the National University and made the constituent university a full university for all purposes except the awarding of degrees and diplomas which remains the sole remit of the National University. Today the university has over 17,000 students - of which there are over 14,000 undergraduate degree candidates. This student base is supported by 2,578 staff - of which 764 are faculty. There are 1104 non academic staff and 710 research staff. The university is one of Ireland's leading research institutes, with the highest research income in the state.The university's internal research reputation spans all of its faculties where it offers over 120 degree and professional programmes through seven schools and 27 departments. The university had seven faculties in Arts and Celtic Studies, Commerce, Engineering, Food Science and Technology, Law, Medicine, and Science. In recent years,the University has been restructured so that it now has four colleges: Arts, Celtic Studies and Social Science; Business and Law; Medicine and Health; and Science, Engineering and Food Science. 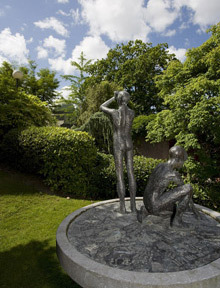 UCC School of Medicine is part of the College of Medicine and Health, and is based at the Brookfield Health Sciences Center on the main UCC campus and is affiliated with the 880-bed University College Cork Teaching Hospital, which is the largest medical center in Ireland. The UCC School Of Pharmacy is based in the Cavanagh Pharmacy Building. UCC is also home to the Irish Institute of Chinese Studies, which allows students to study Chinese culture as well as the language through Arts and Commerce. The department recently won the European Award for Languages 2008. Each College is made up of a number of different Schools which in turn are made of many different disciplines. The manyundergraduate and postgraduate courses of the university are delivered by these Colleges and Schools.